The Return (original title Vozvrashcheniye) presents an unusual scenario and then uses it to ask more universal questions. At the core is the concept of the father figure; its importance to children, the effects of its absence and of its sudden return. Yet the film is shrouded in mystery, keeping us as much as the kids in the dark regarding the motives. This works well as a method to tell the story, but from it the presentation of themes take some damage. The protagonists are two brothers: Ivan (Ivan Dobronravov) and Andrei (Vladimir Garin). Ivan is maybe around 12, Andrei a few years older. Their father has been absent for most of their lives, his existence a vague memory captured in an old photograph. One day, from out of nowhere, he returns. The brothers are surprised and full of questions, but answers aren’t coming. 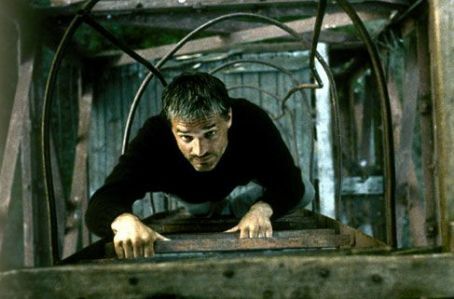 The father (Konstantin Lavronenko) invites, nay, orders them to come along with him on a fishing trip. This marks the start of a journey of mysterious purposes. Our first guess might be that it’s a way for the father to make up for lost time with regards to his sons, but his attitude is cold and harsh. He is not a kind and nurturing father, but a strict authority. Is he trying to instill 12 years of discipline in the span of a few days? Numerous times during the trip, the father abandons one or both of the boys for hours, seemingly not caring about them. Then he returns, again and again. He’ll say one thing to them, then do another. At one point Andrei is tasked to hold his wallet for him. When it’s stolen by another boy, the father tracks down the robber and tells his sons to beat up the young criminal in retaliation. They decline. Then the father gives the robber some money for food. What are his sons supposed to take away from this lesson? That this is meant to be a fishing trip is a deception we quickly become wise to. Yes, the boys do get the chance to catch some fish, but the father clearly has motivations beyond that for the journey. Answers are few, however. We see him conduct some kind of transaction at the docks. An odd-looking package is loaded into their car. A body? Later they take a boat to an island (the father makes the boys row when the engine gives out). He digs up a buried chest, but we don’t know what’s in it. Neither do Ivan or Andrei. The boys react differently to their father during the trip. Young Ivan hates him, finding him unloving and unlovable. Andrei falls in line more easily, eager for dad’s acceptance. The atmosphere of the film is as unwelcoming as the father character. Director Andrei Zvyagintsev paints in gray-ish washed-out colors. Heavy rain starts and stops falling repeatedly, the sky never clearing. The trip often involves physical hardships, and the sense of exhaustion conveyed is potent. It is in these things that The Return is the most impressive. We can always understand the boys’ mindsets: Ivan’s resentment and Andrei’s tentative respectfulness. It’s a testament to both the director and to the young actors, especially Dobronravov who fully captures the helpless anger of a child. (On a side-note, Garin tragically drowned shortly before the film’s international release, during circumstances creepily similar to a key scene in the movie). But while a lot is said by the film, perhaps the greater importance is to be found in what isn’t. We never find out the purpose of the father’s enigmatic journey, nor why he returned to his family or why he insisted on bringing along his kids. While this mirrors the confusion children can feel towards adults when they behave and act in ways they don’t understand, it’s not entirely satisfying. We’re also not shown much of what the boys’ life was like before the father returned. While their current moods are always evident, it would be interesting to see what the effects of the missing father figure were. There are a few scenes early on that shed a little light, but Ivan and Andrei just seem to act like children always do. I can’t read much from this. The movie leads up to a climax that surprises, followed by an ending that asks more questions than it answers. Perhaps this is the only way it could end. There are no simple explanations to be had anywhere in The Return, something very much reinforced by what transpires in the closing moments. While ambiguity can be a wonderful quality and being told everything explicitly can be tiresome, I find it hard to say what I’m supposed to take away from this film. The shadows cloud a bit too effectively. That said, as a watching experience, it works. 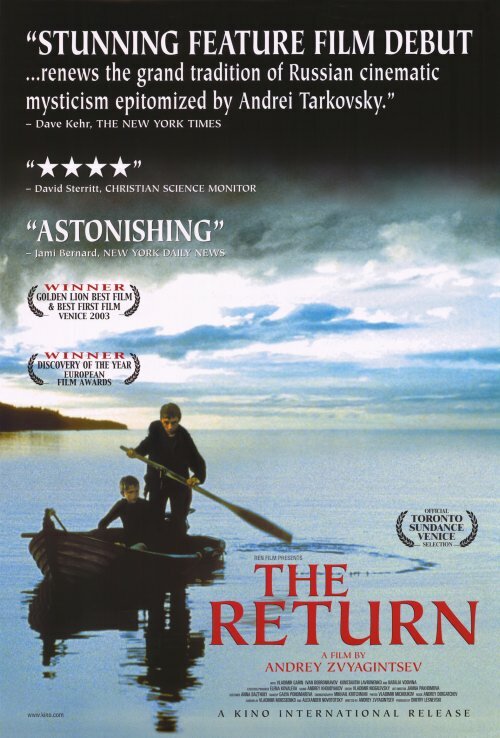 The Return is a mysterious and atmospheric film with compelling performances. The way the story played out had me hooked throughout. It was only after the film was over that my partial misgivings set in. Indeed. This is only the second Russian film I’ve ever seen (the first one was Night Watch, which I really didn’t like). It is true that this particular film has a bizarre and haunting atmosphere in it. It revolves around just three characters. The unanswered questions and the mystery inherent in it starting from the father’s unexpected return and ending with the display of several family photographs is what that makes it worth watching. The cinematography was brilliant which makes heavy use of dull colours like grey to match the bleak atmosphere and of course the direction and acting. Liked this film for its unusual nature.